Homesnap, the market-leading national home search platform that provides real-time MLS data to consumers and a mobile productivity tool for agents, today announced the release of Homesnap Pro+, a tool that helps real estate agents set up and manage their Google My Business Profile, a task that has often been challenging for agents. 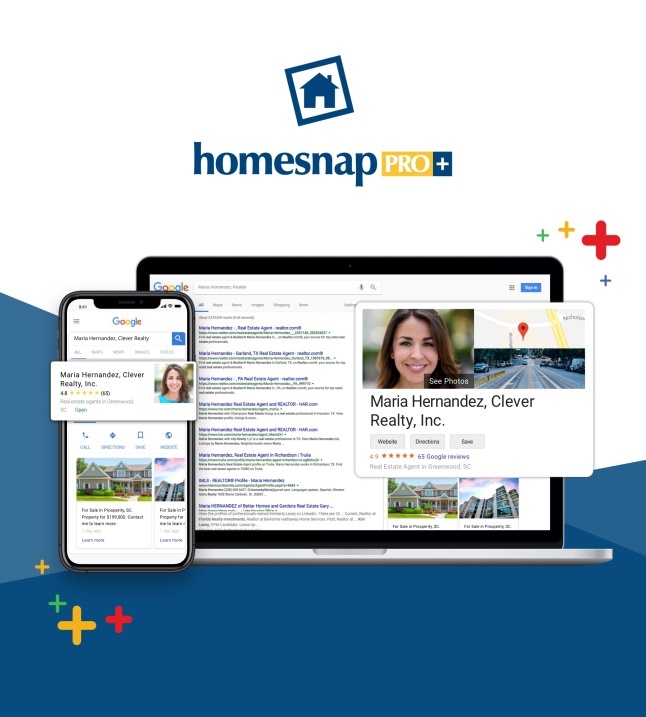 Homesnap Pro+ helps agents set up their Google My Business Profiles and manage their profiles in real time, thanks to Homesnap’s access to up-to-date MLS information. ● Google My Business Profile: Homesnap will assist agents in setting up their Google My Business Profile and will automatically load it with their photos, listings, contact information and more. ● Generate and Manage Reviews: Homesnap will assist agents in soliciting reviews from current and past clients, alert agents when they receive a new review, and send agents regular performance reports. ● Automatic Posts & Updates: Homesnap will help agents turn all of their new listings and recent sales into posts and will also publish insightful market commentary on their behalf. In 2019 and beyond, Homesnap Pro+ will continue to roll out features and tools that help agents provide better client service and connect with prospects in real, tangible ways. For more information visit www.homesnap.com/pro/plus. With easy-to-use mobile technology fueled by unmatched, real-time data intelligence, Homesnap is changing the way real estate agents connect with consumers and serve their clients. The industry-endorsed Homesnap platform leverages real-time data from 170 MLSs to empower millions of consumers each month with a superior home search experience, while providing over 75% of U.S. agents with access to powerful mobile tools that automate their work and accelerate their success. With the Homesnap mobile app, the highest rated consumer home search application; Homesnap Pro, the industry-standard mobile business platform for agents; and the Homesnap national home search portal, a joint venture with the industry-backed Broker Public Portal, the integrated Homesnap platform is transforming the industry by bringing real-time to real estate. More information can be found at www.homesnap.com.